Just to clarify, I'm only selling frame, headset, wheels and seatpost here. Forks, drivetrain and brakes are not available. -Selling my remedy frame as I've just got too many bikes! 21.5" frame. Would suit people 6ft upwards. I am 6'2" and it fits really well. It's had a fair amount of use, but been looked after meticulously, I work in a bike shop so it's been serviced regularly. It has frame protector on all main rub areas. Although some rub has occurred, there are a few minor scratches but no dents or cracks. I have a spare mech hanger that I'll include in the sale. -Also the headset is available for an extra £30. The top half is the original cane creek, lower half I replaced with a hope mix-and-match. -Rockshox Reverb Stealth Seatpost 31.6 x 380mm, Right hand lever, Matchmaker compatible. With 20mm & Q/R conversion cups for the front wheel. Good condition, A couple of small dings in rear rim, Rear wheel is tubeless, never got around to doing the front one. With Bontrager XR4 tyres, very small amount of wear to rear only. Last edited by albash82 on Tue Apr 02, 2013 6:38 pm, edited 16 times in total. 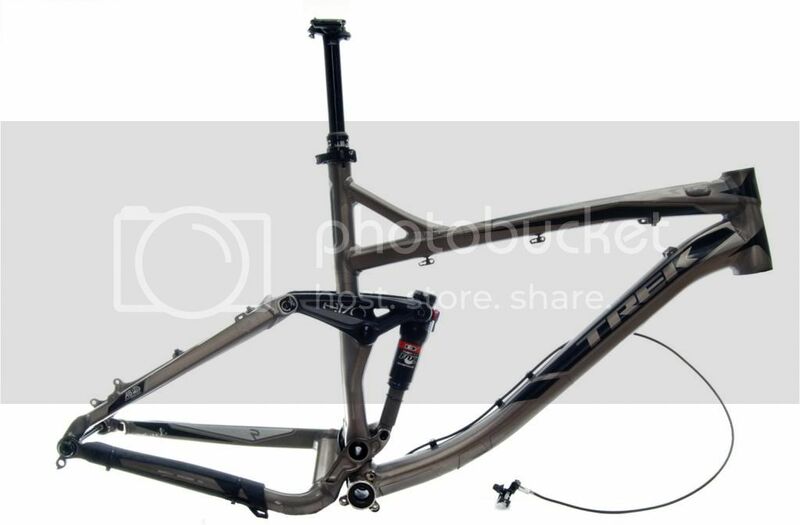 Post subject: Re: FS - Trek Remedy 9, 2012, 21.5"
Post subject: Re: Splitting - Trek Remedy 9, 2012, 21.5"